Sometimes I can’t figure out if the staff has gone a tea break or a smoking binge. 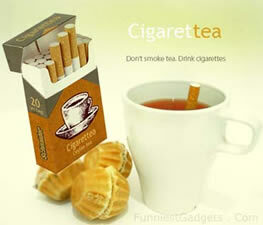 But tea breaks just got quirkier; with a tag line that goes “Don’t smoke tea. Drink cigarettes”, you can imagine what a fun thing this one will be. Imagine you’re on for a tea break and you pop out the ciggies (ala Bridget Jones style) and drop it into a cup of boiling water. Wonder what Mark Darcy makes of all this! Sniggers aside, you have made yourself the perfect cuppa tea cause the ciggie you dropped in is actually tea in disguise. The filter works like a float and the tea tastes divine. The Cigarettea contains no tobacco. Sorry folks no word on pricing or availability of the Cigarettea.